Podcast / downloadable mp3 file. What happens when you couple a YouTube sensation with actual scientific information that helps us better understand the physical world around us? What you have is a fantastic learning opportunity, and a chance to change people’s lives as they develop a thirst for knowledge and a willingness to take a hands-on, participatory approach. Television programs such as Numb3rs (http://www.cbs.com/primetime/numb3rs/ ) and Bones (http://www.fox.com/bones/ ) make math and forensic anthropology suddenly amazingly revelatory. They give people a new way to see the world. It’s not just about watching all the series on television, though. It’s also about how good television (and good instructional design) bring together current events and issues that people really care about, and then they relate them to a story. They build a narrative of explanation and engagement. Here’s an example. Do you remember the summer of 2006 Diet Coke and Mentos craze? I remember jogging on a sidewalk bordering a par 3 golf course near where I live. It was littered with Mentos wrappers and 2-liter Diet Coke bottles. At first I didn’t know what it was about. Then I realized it was all about playing the cool mad scientist, creating exciting explosions. What was the cause? Perhaps you remember the YouTube sensation -- EepyBird.com (Entertainment for the Curious Mind) had posted “Experiment #137,” a wild experiment using 200 liters of Diet Coke and countless Mentos to create an intricate choreography of effervescing fountains, which was billed as a mini-Bellagio. The spectacular bursts of foam and liquid were accompanied by wonderfully retro techno, reminding one of “She Blinded Me With Science” (Thomas Dolby) or “We Are the Robots” (Kraftwerk). The video was posted and reposted on YouTube (http://www.youtube.com/watch?v=hKoB0MHVBvM ) and was embedded in websites and e-mails throughout the world. EepyBird.com’s next production was a euphorically successful “domino effect” -- Experiment #214. Hosted by google video, almost 5 million viewers have logged in to see how 251 bottles of Diet Coke and 1,506 boxes of Mentos create explosions of liquid, not fire. It’s refreshing to see this rather than fireworks. And yet, if one watches the videos alone, it’s somehow unsatisfying. What’s missing? It’s the explanation. They never say HOW or WHY the reactions happen. The answers came one night in an unexpected way. The boxed set of DVDs I had ordered had arrived. I was watching Season Two of Numb3rs when the characters in the series re-enacted the Mentos and Diet Coke experiment for an Applied Math course, and accompanied the explosions with an explanation. The answer involves surface tension. There is extreme change upon the sudden introduction of a highly irregularly micro-pitted gum Arabic and gelatin disc into a liquid under pressure (due to the carbonation), where the only way for gas to escape is through a narrow neck after the contact of the two creates a rapid phase change. The way the surface tension changes is explained here. An alternative explanation is provided by AeonFlux (http://www.aeonflux.com/ /) than a person we can relate to. AeonFlux characters tend to be projections of fantasies and alter egos. On the other hand, human beings with human frailties make you feel as though the knowledge they are imparting is achievable as are their skills. The Story. The mind makes meaning by means of stories. Predictable narratives, events, cognitive signposts, archetypes -- all help you remember just how the math worked and why. Cause-Effect. The science experiment and the math equation do not exist in a vacuum. Instead, they reside within a causal chain, and it is one that allows the viewer (or the online learner) to insert the equation in an analogous situation. For example, in one of the episodes of Numb3rs, Charlie proposes that certain acts of violence set off chains and exhibit flock behavior. There may not be anything too revolutionary in the idea of murders and retribution, but the methodology used to analyze the events and the victims lead to being able to pinpoint the individual responsible for triggering chains and long series of retribution killings. The causal chain also helps put order into chaos and helps us understand our often inexplicable world. Math Keeps Us Safe. Patterns protect us. We see this every time there is a severe weather alert. Doppler radar, wind sheer measures, etc. all form patterns. Although we may not understand the complex mathematical expressions, the differential equations, the probability and statistics, we do understand the basic expression of it. We understand that our ability to survive often hinges on our ability to detect, explain, and model patterns. Patterns often have predictive ability, which helps us immensely. Math makes us feel secure. High Impact E-Learning Intro: Flash image of a threat -- an approaching tornado? Numbers, equations could spin out from the vortex. A storm spotter enters a number in computer, makes a phone call. Flash of light, and the tornado transforms into a rainbow. An Attainable Paradise. 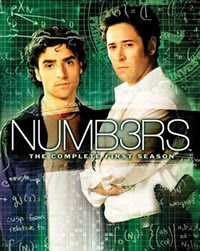 Numb3rs takes place in an FBI office, at crime scenes, at a cool, shambling craftsman house, and a nicely manicured college. The college and the Epps home are refuges in a tough world. This is where the love is. It’s where the math takes place. Partnering with Technology. 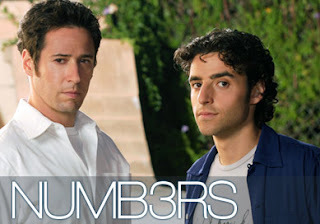 Texas Instruments has partnered with CBS and has developed a website that ties with Numb3rs introduction, “We all use math every day.” Located at http://www.weallusematheveryday.com/ , the site includes a wonderful repository of activities that tie together with the episodes. One example is a worksheet to help students learn how to apply math to flock behavior, which corresponds to an episode dealing with a change of gang leadership. One of the most appealing underlying messages of Numb3rs is that the creativity you have is what makes you special and desirable. E-learning techniques -- both online and through mobile devices - that engage the reader and use techniques from television series and YouTube phenomena to teach math are not just teaching a subject. They're making math and science exciting. At the same time, these approaches are teaching and modeling how to be successful and to connect life and learning in an increasingly confusing world.